The Jac return triumphant from their 2017 tour of Korea to share their music with audiences across New Zealand. The tour will feature brand new compositions, alongside two of the pieces commissioned for The Jac/Black String (Korea) collaboration last year, both of which were nominated for Best Jazz Composition at this year’s jazz awards. 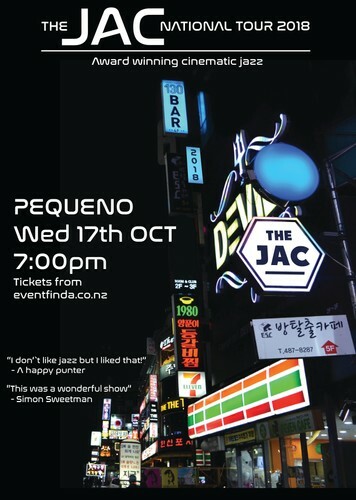 Since 2011 the 8-piece ensemble The Jac has been a leading voice in the New Zealand jazz scene, pushing a modern sound with their distinctive, through-composed compositions, tight ensemble playing and impressive live shows. Based in Wellington and drawing talent from Melbourne and Montreal, the band brings together musicians from the jazz, classical and metal scenes. The Jac have gone from strength to strength: their debut album Nerve (2014) was nominated for the NZ Music Awards Best Jazz Album of the year; the opening track “Sons of Thunder” from The Green Hour (2015) won New Zealand’s inaugural Jazz Composition of the Year award; in 2017 they performed 12 shows around the country as part of Chamber Music New Zealand’s “Encompass” tour, solidifying their cross-genre credentials; and this was followed by a headlining concert with Korean traditional/jazz fusion group, Black String, at the Wellington Jazz Festival, which sold out and garnered rave reviews. A spot at the Jarasum International Jazz Festival and a tour of 6 cities in South Korea followed. The band features musicians bringing influences and expertise from outside the jazz spectrum, notably Matthew Allison, associate principal trombonist in the New Zealand Symphony Orchestra, and Shaun Anderson, drummer for metal bands Saving Grace and Depths. Completing the line-up are Alexis French, trumpet; Nick Tipping, bass; Chris Buckland, saxophones; Daniel Millward, piano; Callum Allardice, guitar and compositions; and Jake Baxendale, alto saxophone and compositions.